The findings of a study presented during American Heart Association’s 2013 Scientific Sessions unveiled some disturbing data on salt consumption in a global scale. The study uncovered that 75 percent of the world’s population had been consuming close to twice the recommended salt intake per day. Only Kenya is able to meet the American Heart Association’s recommendation of less than 1,500 mg of sodium daily. The average intake in the United States is a staggering 3,600 mg of sodium per day. Excess salt increases blood pressure. This contributes to the development of cardiovascular disease. And cardiovascular disease is the leading cause of death worldwide. Here are effective ways to stay within the heart-healthy daily limit for sodium. Edibles that contain high levels of salt include anchovies, bouillon cubes, canned foods, cheeses, croutons, ketchup, mustard, olives, pickles, processed meats, and soy sauce. Resort to their low-salt versions whenever possible. If you make time to prepare and cook your food, then you get to avoid prepackaged meals that are laced with sodium. Sodium keeps them flavorful because the processing has robbed them of their flavors and nutrients. 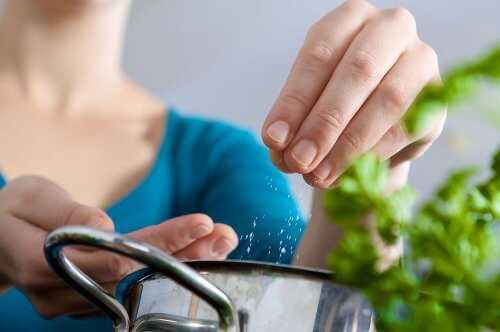 If you prepare your meals from fresh and whole ingredients, then you can easily control the amount of salt added. The foods are healthier and more delicious, too. When using canned vegetables and tuna, for example, you may want to rinse them first to remove excess salt. This lessens your dependence on salt for flavoring foods. Use dried herbs and salt-free spices to offset the need to season liberally with salt. Basil, garlic, oregano, pepper, and thyme can add flavor to a dish without the extra sodium. When following the instructions of a recipe, cut the amount of salt in half. Taste the food with half the required amount of sodium. If you are happy with it, then there is no need to add the exact salt quantity that the recipe calls for. Be discerning of what you eat and make healthier substitutions. As long as you eat processed foods sparingly and you watch what you put in when you prepare meals at home, you’re pretty much covered. Substitute low-salt or salt-free alternatives. When you need a quick pick-me-up, think crunchy fresh fruit instead of heavily salted chips. So how do you reduce your salt intake when it is practically present in almost all commercially prepared food? How do you deal with food stuff that naturally contains salt? Share your thoughts, please!